Fast forward to a decade or so ago, and I wrote this post, about some breadfruit from my grandmother’s backyard in Cebu, and a new appreciation for this starchy staple was born. Now I look for it when the hot summer months hit, and last week, I was given 3-4 fruit from the tree in my grandmother’s home, even if we sold the place several years ago. The new owners were kind enough to send me some of the prized fruit, which from this particular tree, and in it’s setting, bears the most amazing breadfruit. Bland for most people, this particular breadfruit is a little more flavorful with just a hint of sweetness. It is PERFECT deep fried in lard and either plain with latik or cooked with good muscovado sugar melted and caramelized onto the sliced of breadfruit, in a banana-qua style treatment. I’m told it’s not that easy to grow this tree, even though it seems common enough in the provinces, but I guess with no seeds, perhaps one has to marcot the tree. It’s too bad this isn’t more readily available in markets, it would make a terrific, delicious, economical dish to serve at home or in restaurants. Coconut sugar (gula malaka) melted with heated packet of frozen coconut milk becomes intensely flavourful latik. When I see breadfruit I think of Paul Gauguin and Captain Bligh. The former easily the only Post Impressionist to have depicted breadfruit trees. The latter tried and failed to transport breadfruit trees from Timor to the Caribbean. He never reached the West Indies, off course, due to the (in)famous movie starring Marlon Brando. The crew after having tasted the allure and welcome of native women ached to stay put and who can blame them. Life at sea was rough made unbearable by Captain Bligh’s verbal and physical abuse. Anyway, it is fair to deduce that latter day blond and blue-eyed Tahitians sprang from the mutinous liaisons. Oh this is called Kolo then? Saw some in a Vietnamese market, didn’t buy any, didn’t know what it is. Next time I see it, I will get one for sure. I remember my Tia in Quezon cooks it as ulam. I missed this “veggie”. Try roasting a breadfruit. Find one that is firm but getting ripe. Score it (with an “x” just to vent the steam) where you take off the stem and on the other end if you want. Then throw it on a charcoal fire (you can just throw it in the oven or on a gas grill but it won’t have any smokiness). As the skin blackens, turn it until all the skin is really charred. Then peel it, core it and slice in thick wedges while it is still very warm. It’s great by itself or with butter. I think it would be a great side for a serving of your lechon. In Jamaica we eat it with our jerk pork and lots of other things like ackee and saltfish which one of your readers mention on the earlier breadfruit post. 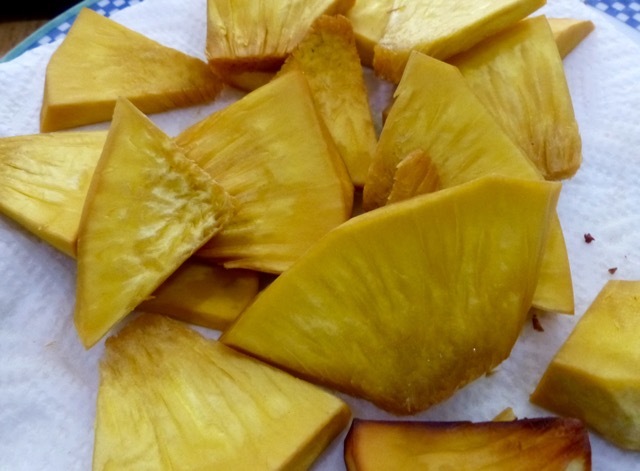 Leftover roast breadfruit – slice into thinner wedges then fry – depending on how you want it – thin like a chip, medium like a french fry or thick like a steak fry. Salt, we don’t put sweet stuff on it in Jamaica. We also boil it in thick soup but I prefer it roasted or roasted then fried. Recipe for glazed breadfruit from home. Peel a ripe but still firm breadfruit. Slice into 4, 6 or 8 wedges (your preference) from pole to pole . Slice wedges into approximately 1 cm thick pieces just like the bottom picture above. Soak in lime water (1/2 cup of slaked lime (apog) to 1 gallon of water) for 2 to 3 hours. Rinse and drain thoroughly. Prepare syrup by bringing to a boil 1 cup of water and 1/2 kilo of granulated white sugar. Add the breadfruit pieces and cook slowly until done. Test for doneness after 10 minutes. It can be eaten once it has sufficiently cooled down at this point although it would be syrupy. Reheat slowly for another 10 mins two more times or until the syrup dries up and crystallizes. You can add a slice of ginger, a stick of cinnamon, a few cloves or a lime or orange twist to the syrup for additional flavour. I remember that in Batangas, we simply cut and boil it just like sweet potatoes then peel it and dip to brown sugar or muscovado. Nice and affordable merienda. 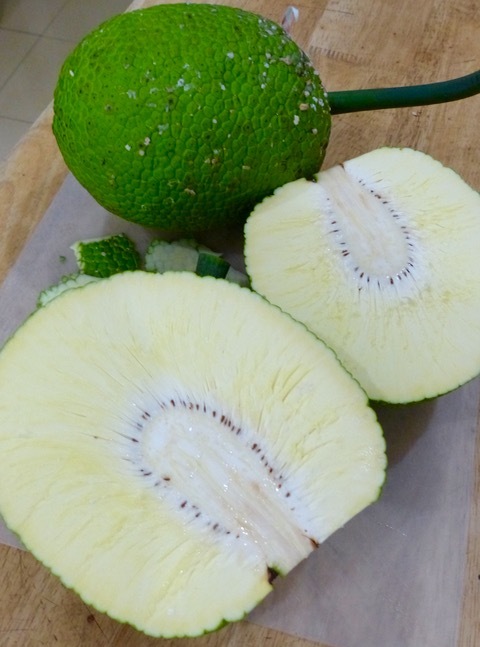 where can i buy the breadfruit in Manila?